Georgina Bell Liebsch is a certified paralegal with more than 20 years of experience in litigation. She works exclusively on personal injury cases, with emphasis on medical malpractice. Georgina graduated from Seton Hall University in 1996 with a Bachelor’s degree in history. In 1998, she received a Certificate in Paralegal Studies from the American Institute for Paralegal Studies. Georgina calls upon her compassion, empathy, and problem-solving skills to help clients navigate the legal, medical, and financial challenges that accompany devastating injuries. 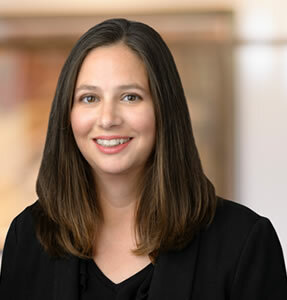 She is involved in cases from start to finish, and assists with record retrieval and digesting, drafting and responding to discovery requests, and preparing for depositions and trials. She is available to answer general client inquiries. Georgina coaches softball and soccer, and acts as chauffeur for her very active children. She enjoys cooking, when time permits, and is an aficionado of the Discovery and History channels.